Located in the south-western suburbs of Sydney, the suburb of Cabramatta is home to people of diverse backgrounds. Most of these people trace their ancestry to a number of Asian nations, the strongest representation being Vietnamese, but also comprising those of various Chinese ethnicities, and others from Lao, Thai and Cambodian heritage… and the list does not end here! Because of this cultural diversity, Cabramatta has acquired a reputation as a centre for purchasing all things Asian, including a wide range of fruit and vegetable offerings. For those, like me, who have an interest in growing Asian-origin fruit and vegetables, this accessibility is a real attraction: you never know what delicacies you might find for sale in the shops and stalls of Cabramatta. And the gardener has a very real opportunity to secure some unusual, but valued, seed-stock for the Asian garden. With our time in Sydney drawing to a close, and a move to a new garden in a warmer, more northerly and less frenetic clime ahead of us, the Better-Half and I made many excursions to Cabramatta during the warmer months. Here, we were able to purchase many wonderful fruits for the table, with the added bonus that we could extract the seed to grow our own trees for the new one-hectare property. Be careful, though! Some mango and avocado varieties will not bear fruit true to the original type. The advantage of these varieties, such as Keitt mango or Hass avocado, is that you might even produce a very worthy mango or avocado differing in some respects from the original fruit. Our excursions to Cabramatta were bountiful. Most prized among our finds were the various Asian mangoes. With luck on our side, we have been able to sprout successfully Nam Dok Mai, Chokanan and Falan mangoes, all of which should grow true-to-type from seed. One needs to be careful, however, to source fruit which has not spent too much time in cold-storage, as this will inhibit germination. Our local friends have advised us that the best time to shop for the freshest fruit is on Tuesday morning in season. 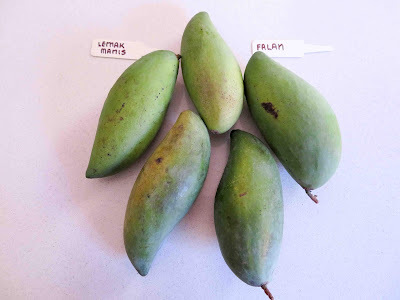 Of course, if you should fail at the first attempt, keep trying… Keep eating those deliciously-sweet, ripened Chokanan and Falan mangoes and pop the seeds into some potting mix: there appears to be no chance of purchasing trees of such mango varieties in Sydney nurseries. 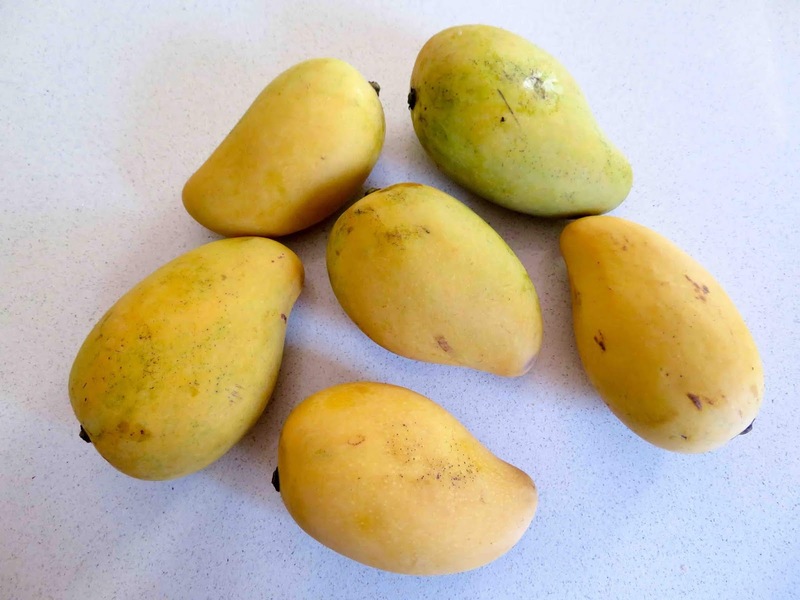 Chokanan mangoes are always sold as ripened fruit, making their seed relatively easy to grow. 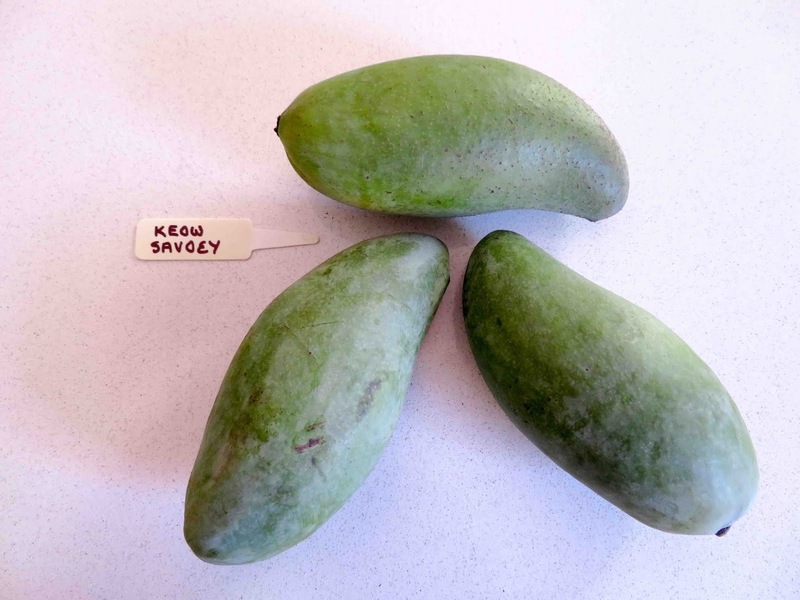 Keow Saveoy are the most famous of Thailand's green-eating mangoes. In Cabramatta, it is always sold green. Because of this, it is a much more difficult proposition for growing from seed. Fortunately, we have not only sourced mango seed, but also the seed of luscious longans and lychees, custard apple, juicy jackfruit, starfruit and even Malaysian chiku (sapodilla)… all successfully grown for the new garden. Falan mangoes are delicious when ripe. However, they are sold as green-eating fruit locally. You will need to be patient: ripen your fruit in rice and hope for the best when you extract the seed for planting.